We are finally getting a chance to see a real match and that is pretty exciting. Seiring is taking on Shutoku in a battle that will shape the outcome of the Winter Cup. Taking on a member of the Generation of Miracles is never easy and it is going take more than a new center and an improved Kagami to win this one. I will say that this battle could take a few episodes, but I am up for that. The matchup that we were waiting for. The episode starts with the end of the preliminary round of the Winter Cup. They are onto the next round that will only allow eight teams to advance. You need to come out of this one with a minimum record of 2-1 which is not easily accomplished. Teams like Seirin and Shutoku are in the same bracket meaning one of them will be put into a high pressure situation. Both teams are coming into their matchup at 1-0, so the winner will advance regardless. Tensions are high as Shutoku has not forgotten the loss that they suffered against Seirin in their previous matchup even though they were the better team. That isn’t the only drama coming into this one as the other scary team in the bracket boasts a crown less king that may be the reason for Kiyoshi’s injury. That guy is bad news, but we will get to him after this match. Things are intense from the start as defense is key. Kagami is stopping all of the three-point shots coming from Midorima, but this seems to not phase the prolific scorer. Kagami may be a bad matchup for him, but Midorima will not be held down. What does Shutoku have up its sleeve? When will we see Kuroko’s new technique? Where was Midorima’s lucky item? They like to make the villains pretty obvious. I am very excited about what is going on right now. We are getting some real matches and that is what makes the series worth watching. The game between Seirin and Shutoku is going to be interesting, but the encounter with Hanamiya kind of spoils things. I don’t know about you guys, but I instantly assume that Seirin is going to win this game. Why is that? Well, he wouldn’t be in the opening if Seirin wasn’t going to play against him. Due to the structure of the tournament, we know that Seirin would simply advance if they beat Shutoku making this encounter completely pointless. I do like seeing as many encounters as possible because we can’t just watch games against the generation of Miracles, but they could give us a little more suspense. I may be over thinking things, but I definitely can’t be the only one that noticed this. Oh well, Kiyoshi getting more screen time is definitely appreciated. I think that he is a very interesting character. I will say that it seems like we are starting to lose a lot of the characters. 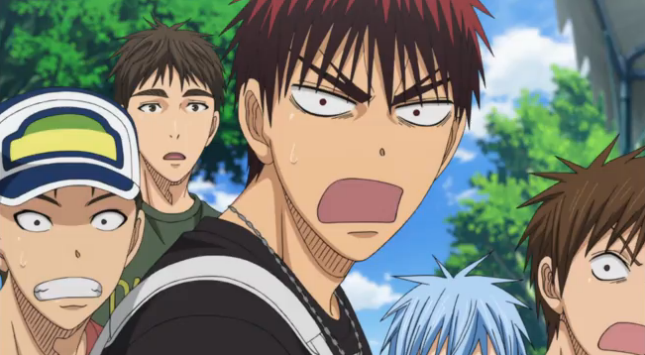 Hyuuga seems much less important than he used to be. We see glimpses of him making shots, but his role as a leader appears to have diminished greatly. Kuroko ends up taking care of a lot of things and Riko will take charge when need be. Hyuuga is one of my favorite characters and I think that the captain of a team should be a more prominent member of the squad. This is about Kuroko, Kagami, and the Generation of Miracles in general, but this is also supposed to be about teamwork. Star power is great, but it seems like there are only three members of the Seirin basketball club. I know that there isn’t a great deal of time in the series, but I hope that the longer games will allow for other players to get some screen time. Simply showing the importance of having Hyuuga as a shooting guard and Izuki as a point guard would be nice. If Hyuuga is losing importance, then Izuki no longer exists. Other teams have it worse if you ask me. It seems like bench play can’t exist in this series. Oh well, at least the characters we have are nice. That is an intense face. Seirin vs Shutoku again, the thought of Shutoku winning for sure definitely came to my mind when I first saw this episode. First time I saw Hanamiya, Lelouch came to mind pretty fast. Most probably because of Jun Fukuyama, though Hanamiya does give off this evil mastermind vibe that Lelouch tends to go for.